Pulse the butter until creamy, add the icing sugar together with the first generous measure of Islay Single Malt. Mix gently until the sugar and the butter have bonded nicely. 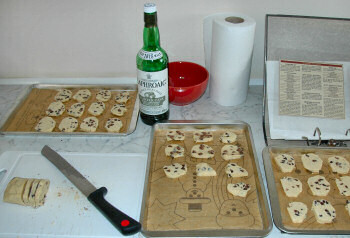 Add plain flour soon followed by more whisky. Add the cornflour and make sure everything is mixed well. Finally add the chocolate chips and knead the dough until everything is well distributed. Because of the liquid it will get a bit sticky and gooey, but it's still managable. Form the dough into two cyclinder shaped rolls and chill. I put mine into the freezer for about an hour followed by another hour in the fridge. On a chopping board cut into a thin slices and put on baking trays. I used non-sticking baking paper to make it easier to handle. 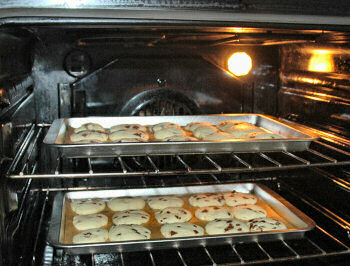 Then bake at 170°C/325°F/Gas 3 for approximately 10-15 min until an even golden brown. Now, was the experiment successful? I think it pretty much was. Now, admittedly the whisky flavour is not very strong, but it is there. 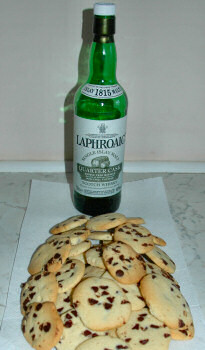 I can detect the smoky peaty flavour of Laphroaig in the back of my mouth when I let one of the shortbread melt in my smooth. They still have a nice smooth melting texture. While not as strong as I had hoped for the taste is there, even I with my limited taste buds was able to detect it. I would expect someone with a better developed sense of taste and smell will notice even more of it. I actually tested it with a few colleagues today, they all said they did notice the whisky. If you try the recipe please let me know what you think, if you taste the whisky as well and how you like it. Happy baking!